ANNVILLE, Pa. – Albright quarterback Mike Knight was named the Rookie of the Year, John Marzka was selected as the Coach of the Year and 15 players were named to the All-Middle Atlantic Conference team as selected by the league head coaches and announced by the conference office on Tuesday. The 15 Albright players named to the team marks the third-highest total in school history behind only the 1997 team which had 17 players recognized and the 2013 team which had 16 players named all-conference. Jonni Cassano, John McKeever, Daniel Sobolewski, Steve Barroso and Malik Gilmore were named First Team All-Middle Atlantic Conference. Knight, Gilmore, Vinny Williams, Jamal Hayden, Rich Kuhn and JaVaughn Patterson were each selected to the second team, while Josh MacLeod, Colton Ryan and Williams were each named honorable mention. Knight becomes just the fourth Albright player to be named Rookie of the Year and the first since Josan Holmes earned the honor in 2008. Knight currently leads the conference in completion percentage (63.4) and ranks third in the MAC in touchdown passes (13) and passing efficiency (133.10). He finished the regular season completing 151-of-238 passes for 13 touchdowns and 1,677 yards. He also rushed for 324 yards and three touchdowns. 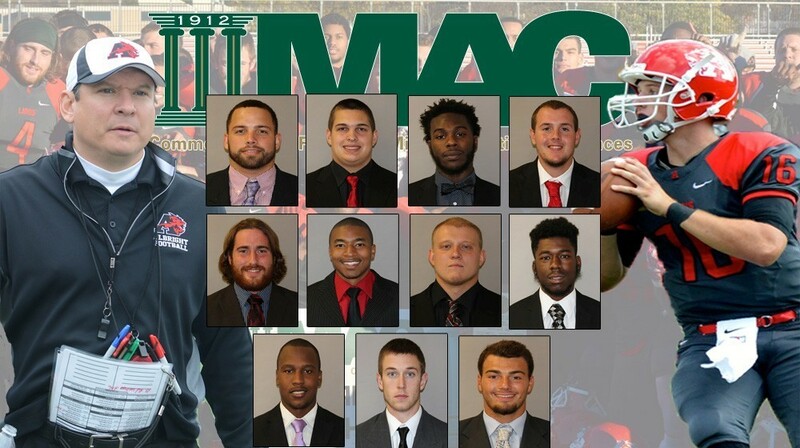 Marzka earned his first career MAC Coach of the Year honor after leading the Lions to a 9-1 overall record and the school's first conference championship since the 2008 season. He becomes the first Albright head coach to earn the conference honor since the 1997 season. Cassano and McKeever each earned their first career all-conference selections after anchoring the Albright offensive line. Albright currently leads the conference averaging 36.6 points per game and the Lions topped 30 points in seven games this season. Albright is averaging 148.4 yards per game on the ground and 198.7 through the air. Sobolewski was named first team all-conference as both a punter and a kicker. He was selected first team all-conference as a kicker in 2014 and was named second team as a punter. The senior is 15-of-19 on his field goal attempts this season, which includes 3-of-3 on attempts from 50 yards or more. He tied his own school record when he connected on a 52-yard field goal against Stevenson and he also shattered the school career records for field goals made and points scored. Sobolewski was named first team all-conference as a punter despite not being able to punt in the last three games of the regular season due to a hand injury. He averaged 43.0 yards per punt on 29 kicks and had eight kicks inside the 20-yard line. Barroso, who was a second team selection last season, led an Albright defensive squad that ranks among the best in the nation. He currently has 63 tackles, 6.0 tackles for loss, six pass breakups, five interceptions, four fumble recoveries and 1.0 sacks. He is the only player in Division III to have at least 63 tackles, 6.0 tackles for loss, five interceptions and four fumble recoveries. Gilmore was named the first team all-conference special teams performer. He blocked two kicks on the season and also returned a blocked punt for a touchdown in the Lions victory over Widener. Gilmore was named honorable mention all-conference as a special team player last season. Gilmore was also named second team as a wide receiver. He currently ranks third on the team with 31 catches and leads the Lions with 452 receiving yards. He has caught four touchdown receptions, which ranks second on the team. Williams earned second team honors as a returner and was named honorable mention as a wide receiver. He leads the MAC averaging 13.9 yards per punt return and is averaging 19.3 yards per kick return. The junior is second on the team with 38 catches and has 390 receiving yards and has scored two touchdowns. Hayden, who was named honorable mention all-conference last season, led the Albright defensive line this season. He leads the team with 14.0 tackles for loss and 7.5 sacks and is third on the team with 62 total tackles. Kuhn earned his second consecutive second team all-conference honor on the defensive line. He has 37 tackles and ranks second on the team with 11.5 tackles for loss. He also is second on the team with 4.5 sacks and recovered a fumble at Lycoming. Patterson earned his first career all-conference honor as a cornerback. He is currently tied for second on the team with three interceptions and returned an interception 95 yards for a touchdown in the Lions victory at Stevenson. He has 42 tackles, 3.0 tackles for loss, five pass breakups, two forced fumbles and one fumble recovery. MacLeod and Ryan were named honorable mention for the first time in their careers. MacLeod is the top blocking tight end in the conference and has seven catches for 25 yards. He caught a touchdown pass versus Stevenson in the Lions 30-26 victory. Ryan ranks as one of the top linebackers in the conference and is fourth on the team with 58 total tackles. He has three interceptions and returned one interception 100 yards for a touchdown in the Lions victory at King's. He also has 1.5 tackles for loss and a forced fumble. Albright will return to action on Saturday (Nov. 21) when it hosts Norwich in an opening round game of the NCAA Division III playoffs at 12 p.m. at Shirk Stadium.